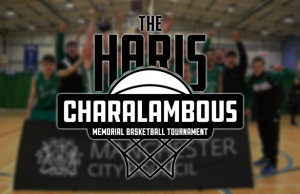 It will be Magic Under-18s vs Akademie Weser and England Under-18s vs CB Cornella in the 2013 Haris Memorial Tournament semi-finals after Day 2 took place on Saturday. Read on to find out results, leading performers and notes. Akademie Weser had little trouble dispatching of CBSZ Zurich, running out 90-29 winners. It took a quarter for the German side to warm up, leading just three after the opening period, but a balanced team effort saw every player register at least two points on the way to the win, led by 13 points from Jan Rohde and 12 from Johannes Menzel. Zurich were led by Andrija Dimitrijevic’s 6 points. 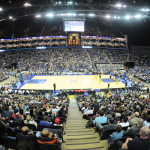 Magic Under-16s proved no match for the England Under-18s, suffering a heavy 91-30 loss. It was the second half where it became ugly, when England held the younger, smaller, side to just nine points through two quarters. 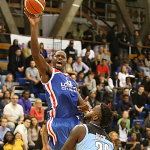 Akwasi Yeboah had another big game for England, with a 17 point, 13 rebound, double double, whilst Aidan Gastaldi-Davies added 17 of his own, 15 which came from beyond the arc. Deane Williams joined them in double figures with 12. Matthew Hodgkinson had 7 points to lead Manchester. Led by 16 points, 11 rebounds and 4 blocks from England Under-18 Aaron Menzies, Manchester dominated Sligo with a 100-38 win. Magic held the Irish team to 8 points in the second half, booking their place in the semi-final against Akademie Weser on Sunday. Joe Swindells led all scorers with 18, with Patrick Whelan adding 14. 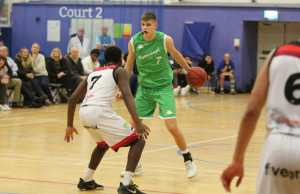 Tobias Brockmann had 13 to lead Sligo, who will take on Magic U16s in the consolation round. England Under-17s managed to hang with Cornella for the opening quarter, before going down 80-50 to register their second loss at Haris. England trailed by just two after the first period, but Cornella pulled away from there, dominating on the break and forcing 30 turnovers to not let England back in the game. 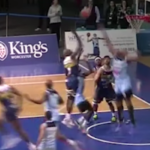 Sergio Caballero had 13 points to lead Cornella, whilst England were led by Kyle Carey’s 9 points. England Under-18s faced their first competitive game of the tournament and came away with a 79-66 win over Akademie Weser from Germany. Trailing after the opening quarter, a strong second period from England saw them gain the lead which they held onto throughout the remainder of the game, despite a last ditch effort from Weser. It means they will now advance to face CB Cornella in the other semi-final on Sunday. 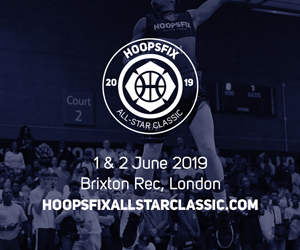 Josh Steel had an efficient 17 points, whilst Dwayne Lautier-Ogunleye and Aidan Gastaldi-Davies finishes with 12 a-piece. 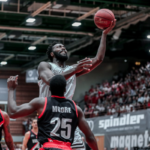 Keno Pape had 14 points and 11 rebounds to lead Weser. Manchester Magic Under-16s got their first win of the tournament with a 72-63 win over CBSZ Zurich. Kayo Redford had 18 points to lead Manchester, with Ayo Nuwe adding 15 and 7 rebounds. Jan Sedlacek had 17 to lead Zurich. 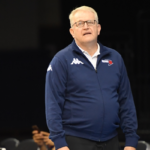 A much more convincing performance from Manchester saw them cruise past Spanish team CB Cornella, 71-45, but both teams remain in the semi-finals on Sunday. 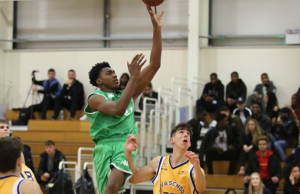 Seven footer Aaron Menzies had another impressive outing with 12 points, 13 rebounds and 5 blocked shots, Patrick Whelan added 12 points, 5 rebounds and 4 assists, whilst Raheem Idris and Pharroh Gordon finished with 11 each. Marti Sanchez was the only player in double figures for Cornella, with 12 points. 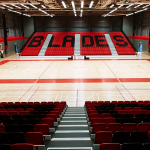 Sligo suffered another heavy defeat, as they dropped 86-51 to England Under-17s. England saw every player get on the scoresheet, led by Kyle Carey’s 18 and Alex Roberts’ 13 points. Sligo were led by Cian Lally’s 14 point, 10 rebound double double. Semi-final match-ups as expected, with a huge drop off in standard outside of the top four. England Under-18s using different starting line-ups every game and making regular rotations as Karl Brown looks to see who will survive the next round of cuts. England U18s team at this tournament is incredibly small (the U17s are even smaller), missing both their seven footers; Barking Abbey’s Nathan Smith and Manchester Magic’s Aaron Menzies. Menzies’ improvement over the last year has been drastic. In the middle of just his second season of playing basketball, he will no doubt get looks abroad. Myles Laurent-Smart is still arguably the quickest player in the country with the basketball. No-one can stay in front of him. Playing aggressive defence too. Akwasi Yeboah having a solid tournament, leading England in scoring so far at 16.0ppg, along with an impressive 11.5 rebounds. 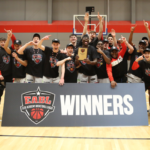 In fact, the trio of Barking Abbey players; Yeboah, along with Josh Steel (11ppg, 5rpg) and Joe Junior Mvuezolo (14ppg, 4.5rpg), all showing no signs of fatigue/jet lag having only returned from the US on Tuesday, being the team’s three leading scorers. Aidan Gastaldi-Davies has been showing the outside stroke, knocking them down with regularity from beyond the arc, finishing with nine threes across both games today (9/17). 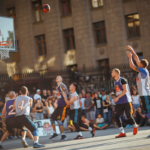 Did you get to any of the games? Thoughts? 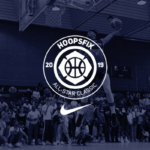 Next Story → Joe Junior Mvuezolo Dunks All Over Zurich at Haris!